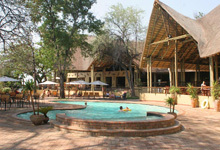 Chobe Safari Lodge is situated on the edge of Kasane on the banks of the Chobe River. 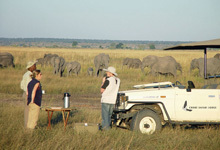 The lodge property borders that of the Chobe National Park, and has sweeping views of the Chobe River and Floodplain. 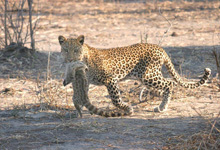 The Chobe National Park itself covers about 11700 sq. kms of Mopane forest, floodplains and perennial river and his home to all of Botswana’s game species. 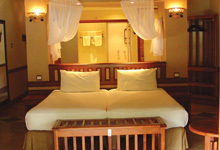 The Chobe Safari Lodge has a variety of accommodation options. The main offering is the forty six air conditioned safari rooms, all uniquely decorated with en-suite facilities as well as televisions and telephones, as well as private verandah overlooking the sweeping green lawns that flow to the rivers edge. The river rooms adjoin the main lodge area and offer twin-bedded air-conditioned spaces, also equipped with telephones , TV and large en-suite bathrooms. The river room complex also has a garden visited daily by an abundance of birds and monkeys. The thatched rondavels (a small round house) are the lodge’s original forms of accommodation. Each rondavel is positioned separate to the next in the green gardens of the property and are equipped with ceiling fans and en-suite bathrooms. 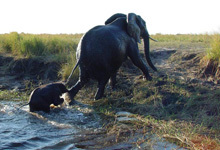 The game drives from Chobe Safari Lodge are conducted into the Chobe National Park which is famous for its large numbers of elephant that utilize the river, and the big herds of buffalo and general plains game that make almost daily appearances on the game sightings list of visitors. The river itself is of course home to an array of waterfowl, pods of hippopotamus, crocodiles and the lesser know puku antelope. 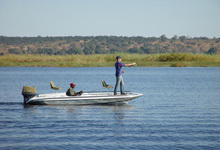 In addition to the game drive activities at Chobe Safari Lodge, game & bird watch from small boats, boat based fishing and river cruises are other activities on offer. These in addition to the lodge’s proximity to both Victoria Falls and the Okavango Delta, makes it an integral part of a safari itinerary.